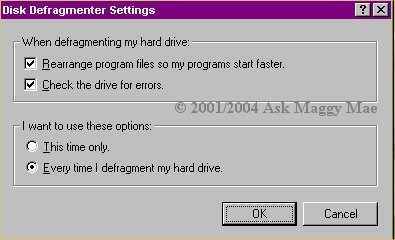 Defragmenting your hard drive help it to make your hard drive run faster. I would advise doing this at least once a week. It needs to be done without running any programs that are going to write to the drive or it will restart defrag and take much longer to run. 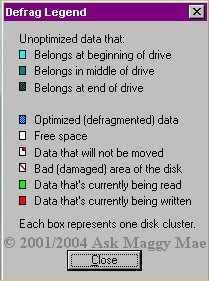 When you first click on the defragment hard drive you will come up with the following screen. Some people have more than one drive so you are given the option of which drive you want to defrag. 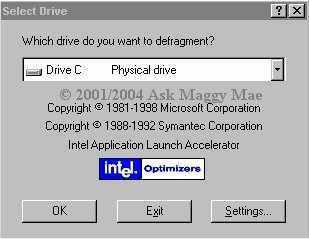 If it's not your default then click on the dropdown box and choose the drive you wish to defrag. Click on the Settings as shown above and the window below will appear. Be sure the items shown below are checked as it will defrag better for you each time. When you click OK in the above two windows the following window will appear, this will show you the progress of your defrag. For a more detailed view of the defrag process click on show details and the following window will appear. When you click on Legend you will see the following window which will tell you what the coloured squares in your defrag means. Once it has read your drive the beginning of the defrag process is rather slow, it actually takes one of these squares at a time and places them for optimal speed, further into the process it will get faster. When finished you will see the following window, click on yes and you are finished.